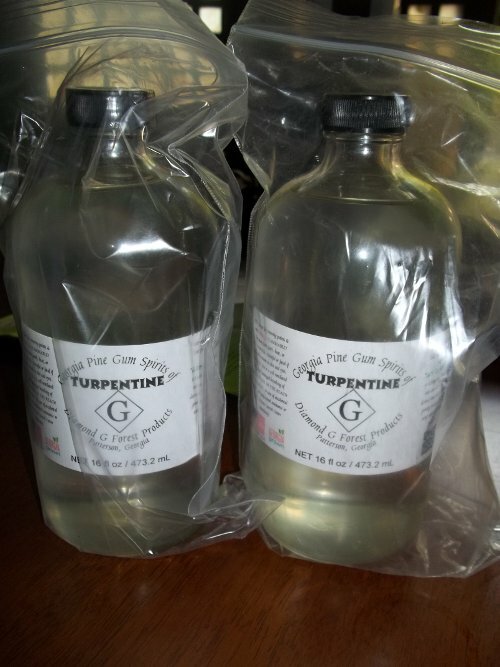 Finally, after 2 months, my order of Turpentine aka Pure Gum Spirits from Diamond G Forest Products in Georgia USA has arrived. This is a traditional remedy for many ailments from Candida to Morgellions or any other pollution that needs to be detoxed out of the body. Mr. Tony Pantalleresco explains in two videos below… plus an introductory video by Dr. Jennifer Daniels on healing candida with turpentine. I was first made aware of this turpentine traditional remedy from www.oneradionetwork.com of Patrick Timpone. He interviewed both Jennifer Daniels and Tony Pantalleresco. Where one uses sugar cubes, and the other uses honey as their carriers. I will have to experiment with both and see the difference. Click on those 2 links to hear their actual radio interview. I have some skin uses on this myself. There are pollutants on my skin that need to get out and so far my other efforts have not fully removed the dirt which seems to have been expelled by melting away at my old fats. Could be the lead and tire chemicals from our old home where I grew up in. I will be experimenting and report my results. I will have to assess the safety of taking this turpentine internally and then find some lucky candida sufferer to cure him or her if she cannot do the virgin coconut oil detox… which a good percentage of people are unable to do. VCO detox is currently what I know works on candida, but with turpentine, it may open new possibilities.